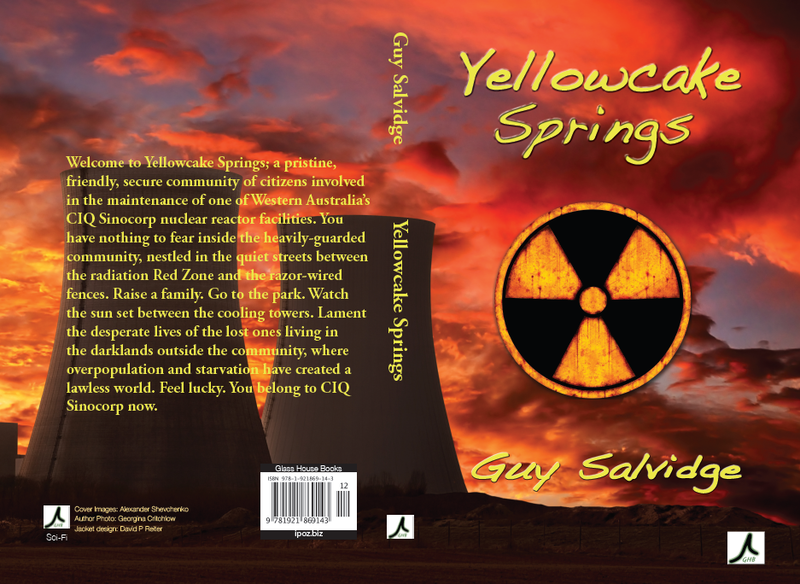 Welcome to Yellowcake Springs; a pristine, friendly, secure community of citizens involved in the maintenance of one of Western Australia’s CIQ Sinocorp nuclear reactor facilities. You have nothing to fear inside the heavily-guarded community, nestled in the quiet streets between the radiation Red Zone and the razor-wired fences. Raise a family. Go to the park. Watch the sun set between the cooling towers. Lament the desperate lives of the lost ones living in the darklands outside the community, where overpopulation and starvation have created a lawless world. Feel lucky. You belong to CIQ Sinocorp now. Author Guy Salvidge leads the reader through a time where an unchecked global population has created a slow, painful apocalypse for all but the elite. Inside Yellowcake Springs, the protection of CIQ Sinocorp provides security, employment and endless leisure in the constructed worlds of Controlled Dreaming State, where citizens using avatars can abandon their inhibitions and responsibilities. Inside the amber zone, Sylvia enjoys a carefree if mundane existence as an advertising consultant with her husband David, whose radical environmentalist interests provide endless gossip for her co-workers. In Controlled Dreaming State she meets Rion, a stranger from beyond the gates. Outside Yellowcake Springs, Rion wanders a wasteland gripped by disease, famine and crime. His only chance to escape the darklands is through an affair with Sylvia, a woman from the inside. As he heads toward Yellowcake Springs, Ryan unwittingly becomes tangled in the sordid plans of Misanthropos; an environmental terrorist group whose plan to lower the earth’s population and destabilise CIQ Sinocorp will cost many innocent lives. The Kindle edition is out now. So is the print edition from Amazon. Buy from Book Depository to receive free worldwide postage. Click on the Yellowcake Springs category on the lower right side of this page for posts relating to this topic. I noticed your enthusiasm for speculative fiction and I write to entice you to my book “La Dársena” and even solicit you to help me get it read by writing a little review. An early draft of it was published in commemoration of the 1989 Loma Prieta earthquake by San Francisco’s beyondchron.org. I’ve got it as an e-book for sale on Kindle, and I’ll provide you a reading copy in word or whatever. Essentially it’s a treatise on communication and compassion. After a massive earthquake has destroyed the coastal town of La Dársena, Michael’s only chance of survival is to reunite with his best friend Maria, who lives in a cabin in the woods. First, however, they have to scare off a monster that’s appeared living on her roof. The feeling of liberty after the disruption of normal life quickly is replaced by fear and panic. As the clean-up methods of the Bureau of Crisis Management get more murderously negligent and the forest offers more dangers, Michael and Maria interrogate the idea that their thoughts, words and attitudes may be exerting more influence over the environment than is usually possible. Michael’s inner struggle with selfish survival and compassion ends up taking everything from him. Most of the background action is from real history (think November 1989 and August 2005), for which I have a bibliography. Thanks for reading in advance, and I hope to hear from you soon. I just had a bit of a look at ‘La Darsena’ on beyondchron and it does look interesting and well written, so sure, I’ll give it a go. Email me and we’ll sort out the details. Thanks to the Ganymedean Slime Mold for its considered review!